In this exhibit, 17 artists investigate bird deaths in Baltimore. The artists explore elements such as light pollution and building collisions that kill as many as 1.3 billion birds each year in North America. The efforts of Lights Out Baltimore and related conservation programs provide the inspiration for their work. 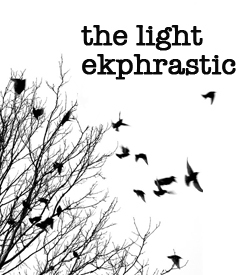 Collaboration between LED Baltimore and The Light Ekphrastic. Sixty-six Baltimore-area writers and artists were chosen to create new work inspired by the work of their partners. Final written works were presented as excerpts on top of art on the LEDBaltimore Billboard, and in full in a special online issue of The Light Ekphrastic. Celebration of 2013 Baker Artist Award b-grant winners.